When Sophia’s Aunt gave her a wood burning kit for Christmas, she was excited because she loves doing crafts. But she had no idea the kit would help her raise over $500 for the Huntington Society of Canada. When the 11-year-old’s Aunt suggested that she create designs on BBQ paddles her Pop made from cedar wood, she agreed. Sophia knew that people were no longer wanting to use bristle brushes on their BBQs, so thought the wood paddles would be an easy way to raise money to fight the disease that took her Nan’s life. Her Pop would send the cedar wood paddles to her from Coachman’s Cove, NL, and she would use her kit to burn designs into them. Designs like “TeamHD” and “CureHD” and fun cooking sayings. The most popular design was “Grillin’ and Chillin’”. Sophia also offered an option to request a custom design. 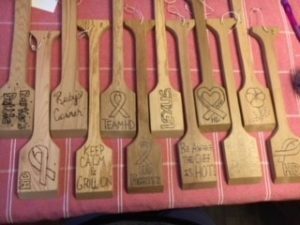 She was happy to be raising money and assumed she would only sell a few to family and friends, so started by making 15 paddles. When there were 5 or so paddles left to be sold, her mom posted on Facebook to see if anyone would be interesting in buying them. 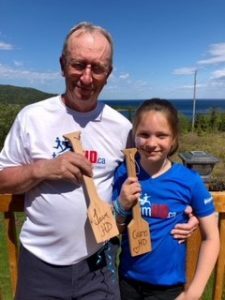 By the end of July, Sophia had sold 60 paddles and raised $600 for the Huntington Society of Canada! Sophia’s Mom, Sherrilynn, says she was shocked with all of the support. Since seeing how popular the paddles were, Sophia has decided to keep doing wood burning fundraisers, but in a different way – with coasters and tree ornaments.